Check here DU Admission Form 2018. Get details about DU Application Form dates, fee and eligibility criteria. Also check how to apply for Delhi university. DU Admission Form 2018 will be released through online mode for all the courses. 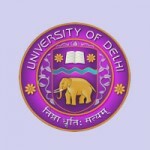 Delhi University (University of Delhi) is public central collegiate university of India. The university organizes a university level examination for admission to the UG, PG & Ph.D courses called as Delhi University Entrance Exam. The admission into these courses will be done on the basis of merit prepared by the score of entrance exam or qualifying exam. Get complete information about DU Application Form 2018 which include eligibility, application dates, how to apply procedure, etc. The university will not provide any facility for DU Registration 2018 through offline mode. DU Admission Forms will be available from fourth week of April 2018 (For PG), second week of May 2018 (For UG entrance based) & first week of June 2018 (merit based). Candidates can fill the application till the fourth week of May 2018 (For PG), fourth week of May 2018 (For UG entrance based) & fourth week of June 2018 (merit based). Candidates can also apply for more than one course in the same application but they have to paid separate application fee for each course. During DU Application Form 2018 filling, candidates have to upload their scanned photograph, signature, self attested ID proof, caste certificate & 10th passing certificate. Keep the printout copy of the filled Delhi University application form 2018 for future use. Qualifying Exam: Candidates must pass their 10+2 or equivalent examination from a recognized board. Minimum Marks: The minimum marks are different for different courses. For B.Tech (Information technology & Mathematical Innovation), candidates have to secure minimum 60% marks (54% for OBC, 57% for PwD/ CW category & passing marks for SC/ST). Qualifying Exam: Candidates should complete their bachelor degree from a recognized university. Minimum Marks: The minimum marks are different for different courses. For M.Tech (Microwave Electronics), candidates have to obtain at least 60% marks. Now, you have to click on “Link to Admission Portal 2017” link. Read the instruction carefully & click on the “OK” button. Fill your basic details for registration. An email will be sent regarding to confirmation of online registration in your registered email id. You have to confirm your account by clicking on that link. Login with the “User Name” & “Password”. Now, you have to fill your personal & communication details. After that upload your scanned images (passport size photograph, signature, 10th class certificate, 12th class mark sheet, category and other relevant certificate (if applicable)). Now, you have to pay the application fee through online mode. After completing all the steps take the print copy of the filled application form for further reference. If you have any other doubts about DU Admission Form 2018, you can leave your query below. ← Get details about IPU CET 2018 Application Form. It include details for IP University Application Form, eligibility, dates & how to apply procedure.